New Patients Are Seen Immediately! Never A Charge For A Consultation. We can see you today! Never a charge for a consultation. 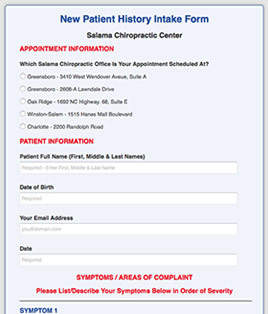 Please fill out the applicable new patient forms below. You will enjoy the time you save by taking care of it ahead of time. Be sure to bring your insurance card with you, too. 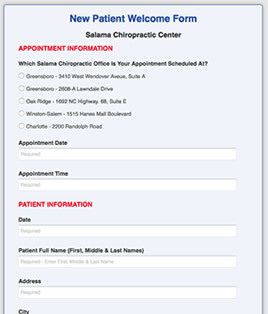 To be filled out by all new Regular Patients. 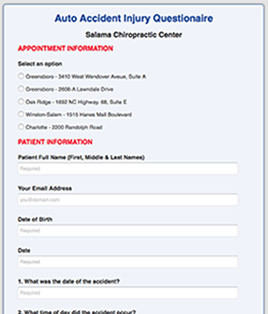 To be filled out by all new Auto Injury Patients. 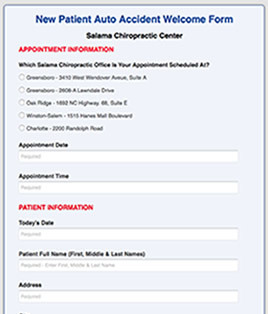 © 2016 Salama Chiropractic Center of Charlotte, NC. All rights reserved.